Learning measuring skills needs lots of practical experience. 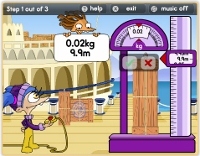 These free online length games and activities will help you to learn skills such as comparing length and height and measuring using millimetres, metres and kilometres. There are also games on volume and capacity, weight and temperature, as well as some very useful interactive tools. Use your knowledge of units of measurement to help Jack the brilliant builder finish the job properly. Jack is looking at different types of instruments which measure different types of things, it is up to you to tell Jack what kind of weighing/capacity measuring device uses which unit. What do we use to measure the capacity of water in a jug, or the length of a block of wood? Use your expertise and help Jack match the correct terms! Jack needs your help again. This time, he needs to measure the weight of parcels. Can you help him read the scales and give him the correct unit of measurement so he can send his parcels off? Now Jack needs assistance with reading volume and understanding capacity. There are jugs filled with water, but Jack cannot read how much water is in there. Help Jack, and don't be afraid to ask him to help with the difficult spellings! Use your knowledge of units of measurement to help Jack the brilliant builder finish the job properly. Finally, Jack needs your help for the last time in measuring the length of an assortment of pencils, using a ruler. Using centimetres and reading from the ruler, can you give Jack the correct answer? In this fun activity, you are the boss. Have great fun playing around with the box net, you can select the width, depth and height of the box, then use the small, medium and large bricks to fill the box up. Click on the sides of the box to make them flap up and see if the cubes you've used fill the entire capacity of the box. You can make the box as big or small as you like. This is a great spatial/visual activity that is strangely addictive and useful for understanding and visualising capacity, making it a great deal easier to learn. 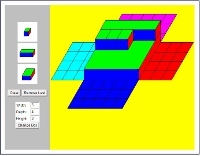 The isometric drawing tool is similar to the Fill the Box activity, but the fun is practically limitless. Use this interactive tool to create dynamic drawings on isometric dot paper. Draw figures using edges, faces, or cubes. You can shift, rotate, colour, decompose, and view in 2d or 3d. Start by clicking on the cube along the left side; then, place cubes on the grid where you would like them. This tool is indispensable for getting to grips with the spatial and visual aspects of capacity. Have fun whilst you draw, create and learn! Use the scale reader to practise your understanding of different weights. Choose you level of difficulty at the beginning, where you can choose maximum weights and choices of whether to make the challenge a little more difficult by including decimal places and/or fractions. Type the correct readings into the box to succeed! In this game you have the choice of brushing up on your skills before you play by entering the practise area. In this game there are four different shapes which all represent different weights, which you can play around with before you start the game for real. Once you feel you are ready, the game begins with an equivalency diagram, for example, one cube may be equivalent to three spheres. The left scale will then be filled with perhaps two cubes, how many spheres will it take to balance the scales? A great game for all ages. The boat will drop off three parcels at the harbour and it's your job to find the right one. A weight and measurement will be given for the correct parcel, it is then up to you to drag and drop the parcels on to the scales, which will then give you a weight and length reading. Is it the correct one? Click the tick if the measurements match what was asked for or click the cross to get rid of it and try again. There are three levels of difficulty to choose from, good luck! In this excellent, expansive and exciting BBC games of the invading zooks, you must help stop the world being taken over by measuring the invading creatures and. In this game, put your knowledge of metric and imperial measurements, weight and length, comparative skills (which is longest/heaviest?) and more. You even get to build your own race track. There's an absolute ton of stuff to learn and enjoy here, with a great story to go along with it. A fantastic, varied and useful series of mini-games. Help Hutch bake a cake in these three different activities. First click on the game you'd like to play. Read the ingredients, then click and drag the right number of eggs into the mixing bowl. After mixing the eggs, click on the right measure when the arrow points to an ingredient on the recipe, then calculate how much more of an ingredient you need to add to the bowl. Click on the mix button to check your answers. Hacker has removed the numbers from all of the Poddles of Poddleville! Can you use the scales to get things back to normal? The Poddles all need numbers, but they don't have to do with how big or small they are, you must use your maths skills to work out the problems and fix the Poddle problems! By only pouring liquid from the large container to the small and sometimes emptying and refilling the containers, you must find 1 quart, all the way up to 8 quarts in this volume puzzle. Each time either of the containers has a volume you need, drag it onto the correct number on the right. It is time to move these fish to their new homes. Small fish move to the small fish tank. Big fish move to the big fish tank. Which fish move where? 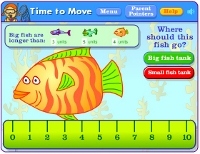 Catch and measure each fish to find out! Welcome to Estimate and Measure with Chef Pierre. Listen and learn with Chef Pierre and friends to understand the difference between estimation and measure and why they are useful. This is a fun activity that is really very informative. Have fun! In this game it is up to you to decide how to dress Mr Bear to prepare him for the outside weather. You are given a thermometer to look at, which you can choose to look at in Celsius or Fahrenheit. You must decide if the reading on the temperature means that the weather is hot, cold or anywhere in between. You must then decide how to dress Mr Bear so he is not too hot or cold. This is not really a game, but this is a really useful interactive tool which can help to cement the numbers on the thermometer that relate to which types of weather. This tool might help with the above activity, where you must dress the bear according the the temperature reading/weather! Click and drag the ruler to measure the length of the parcels and take the reading, then click on the scales to weigh the parcel and take another reading. You must then look at the postage rates chart to choose the correct stamp for the parcel, once you've chosen, click on post to send the package! A great combination of measuring units in this fun activity. Choose from many options at the start as to what type and difficulty you'd like to test your knowledge skills in, from easy centimetres to "super brain" inches. Then play the quiz, measuring the red bar at the top of the screen. Make sure you read the ruler carefully as the difficulty increases!